Of all the types of articles I come across while browsing the internet, one type of article has become my personal pet peeve: articles that claim to list the traits, habits, or other characteristic that is practiced by successful people. Argh. They do something that is noteworthy. Boom. You aren’t going to become successful without doing something. In my opinion, there are so many different ways to do something “noteworthy” that a list of characteristics won’t work for everyone and can even be misleading. 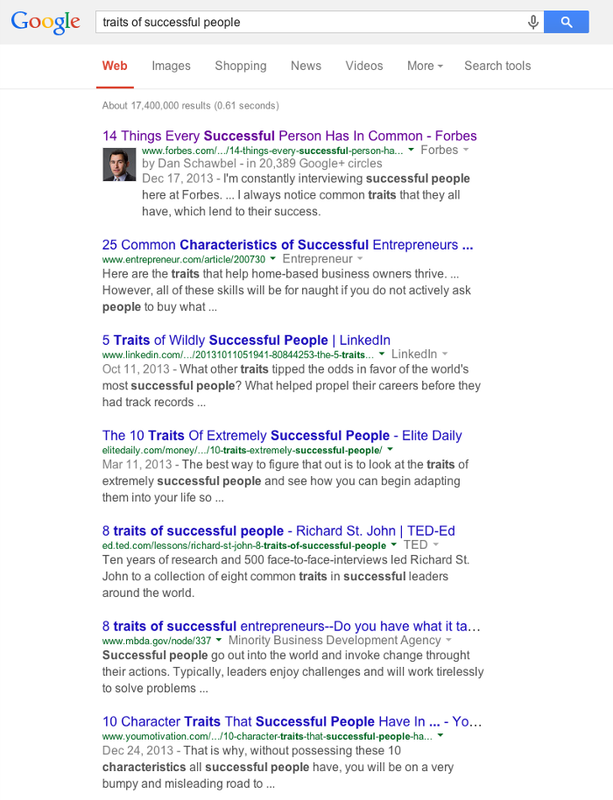 I don’t believe that these articles exist to simply point out what successful people do. If that were the case, there wouldn’t be nearly as many articles describing successful people as there currently are. No. I think that people look at these articles and take to heart what is written, and even try to change themselves to gain more “successful traits”. Personally, I think the main reason these articles exist are because of self validation. If you take a look at one of these articles, you’ll probably notice yourself saying “Yes, I have that trait, oh, that one too. Yeah, I do that.” Amazing, isn’t it? All you had to do was have a few good traits, and now you’re on track to be the next Bill Gates! Right? You probably haven’t read an article called “10 traits of unsuccessful people” recently because you really don’t want to see any of your traits showing up there. You might cry or something. I’ve clicked on a few of these articles before I got fed up with them. I was able to fit my traits or personality to the writer’s list every time. Well, yeah, of course I’m a good leader, remember that one time I decided where to eat lunch?Luckily, “successful people are good spellers” hasn’t shown up on any of the lists I’ve seen, otherwise I would not have been able to fit myself into that trate. How about, instead, you simply improve yourself progressively. Want to be smarter? Find a way. Want to spend more time with your family? Find a way to get stuff done faster or have less on your plate (or live in a one room house). Success is such a loose term that I don’t feel comfortable taking to heart what I read regarding traits that successful people have and that I should have. But maybe that’s just me. Is anyone else fed up with these articles?